This Saturday I finished hike number 20/52 for the 52 Hike Challenge in 2015, and have now completed 231.1 of my goal of 1000 miles for this year. I’ve been wanting to hike to the summit of San Gorgonio all winter, but for one reason or another, I never made it out. I figured I could make up for this by making my way to the summit via Vivian Creek trail for my first hike of the Spring. To reach the summit of San Gorgonio via Vivian Creek trail, I hiked almost 17 miles, gaining 5800 feet to the summit. At an elevation of 11,503ft, San Gorgonio is the highest peak in Southern California. I made it to the Mill Creek Ranger Station right at 8:00 and picked up my permit for the Vivian Creek trail. Although I’ve never seen a ranger while hiking in the San Gorgonio Wilderness, I think it’s always a good idea to follow the rules anyway. Unlike the summer months, the parking lot in Forest Falls was nearly empty. I grabbed my pack and hit the trail at around 9. The first 1.5 miles of this trail climb over 1000 ft before leveling out. Even though the trail head starts at 6000 ft, the warm temperatures have melted all snow and ice. The first ice on the trail started about 4.5 miles in above 8000 ft. Despite the snow and ice, the trail was in really great condition until I hit High Camp at 9200ft. The switchbacks after high camp are still covered in 1-3 feet of snow depending on the lay of the land. Because of this, the switchbacks make for tough hiking, and use-trails in the snow lead a more direct path to to the saddle above. Above the saddle, the conditions improved a great deal, as this section gets a lot of sun exposure. The first patches of snow started to show just after the two trail posts directing hikers to the summit. After the second trail marker, the snow and ice grew a little thicker. There is a false peak just shy of the actual summit, and upon passing that, the trail was about a foot of snow. The warm sun turned the snow and ice to slush, and it felt like sand beneath my feet. Hiking above 11,000ft is tough enough without the trail making things even tougher. 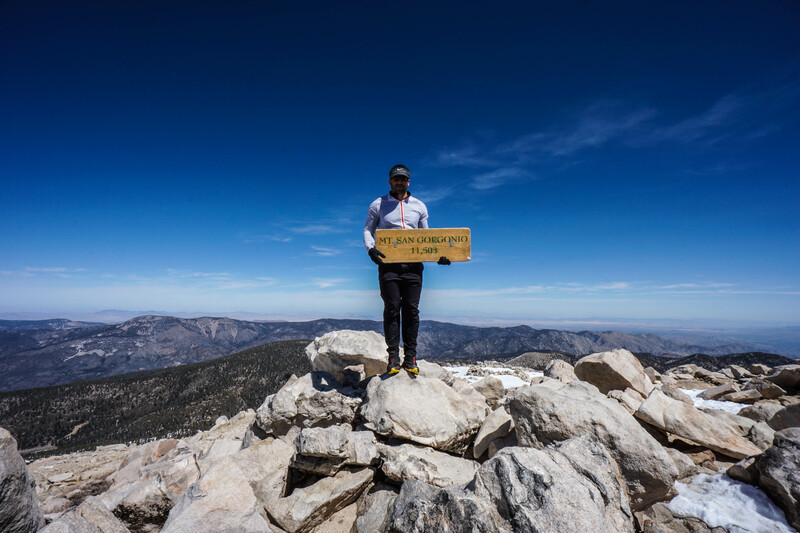 After hiking for 4 hours, I reached the summit of San Gorgonio, and took in the amazing views of Southern California. It was a little hazy down below, but the views were still really great. It’s hard to beat the view from the highest point in SoCal. I stayed at the top to rest my legs for a good 10 minutes before I started getting cold, and then made my way back down the same way I came up. I love that mountain. Thanks again for the hike! It’s a great one! Thanks for reading! Nice one! You’re making some great progress. Thanks, I’ve been trying to stay on pace! So envious of all the wonderful hiking that you have in your area. Kudos to you for taking advantage of it all! That’s a decent day hike:) Great views – I always love a hike where there is some ridge walking included! Nothing like a good hike, on such a gorgeous landscape!